The first day back to the office after a break tends to bring with a jolt and stark reminder of what needs to be done. That’s exactly what happened to the U.S. National Sled Hockey Team when it fell to Canada, 4-3, in its first game of the 2019 Sled Series in Indian Trail, North Carolina. The loss, its first of the 2018-19 campaign, was Team USA’s first game action since capturing the 2019 Para Hockey Cup last December. The U.S. didn’t play a perfect game, and often times made the game difficult with their own decision-making, and still nearly found a way to win. After trailing 1-0 early, two quick goals late in the opening frame saw the U.S. up, 2-1. An uncharacteristic second period and early start to the third period saw the U.S. fall behind, 4-2, before a late surge brought Team USA back within one before time expired. The message from U.S. head coach David Hoff (Bottineau, N.D.) and his staff postgame was simple and clear. Shake off the time apart and have fun in game two. The result? A dominating 4-1 victory. The U.S. took the staff’s lead and simplified its game, making smart plays with the puck and playing its successful aggressive, swarming style of defense to stifle Canada’s chances. 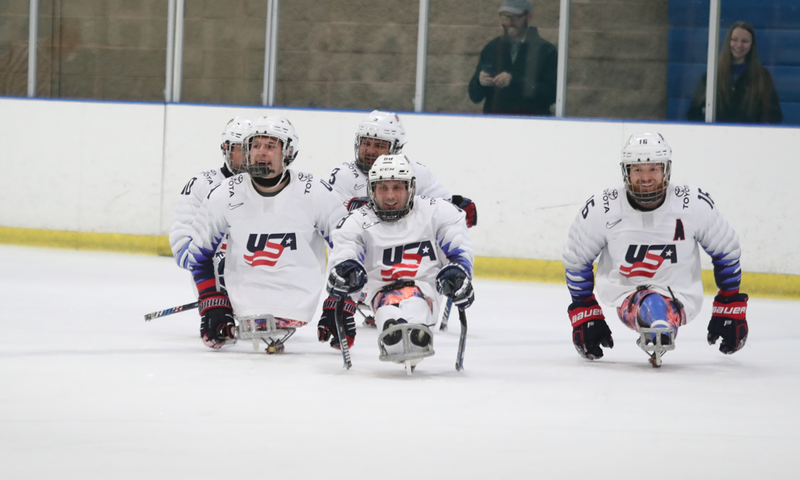 The lessons learned in the 2019 Sled Series will be put to good use as the U.S. prepares for the 2019 Para Ice Hockey World Championship set to take place from April 27-May 4 in Ostrava, Czech Republic. The team will hold a training camp April 11-14 in Indian Trail, giving the Americans a chance to work out any flaws from the Sled Series. For Coach Hoff, the planning for Team USA’s final camp of the season started the minute he left North Carolina. “I made a list as I was sitting on the plane flying home, things that we need to be sharper at,” said Hoff. Among the items Hoff will be working on solutions for are defensive awareness, special teams and shift length. What he won’t have to change, though, is team chemistry. It’s a big part of why the U.S. has won six of its seven games this season and remains a formidable foe each time the team takes the ice. In reflecting on the 2019 Sled Series, U.S. veteran goaltender Steve Cash (Overland, Mo.) deferred to the message Coach Hoff stressed in that the team needs to make themselves tough to play against and maximize their talent. Cash split goaltending duties with fellow veteran U.S. netminder Jen Lee (San Francisco, Calif.), who made his first-ever start against Canada in Friday’s 4-3 loss. “I’m really happy for Jen not only to get that start, but to see the team fight its way back into the game and try to get a win for him,” Cash said. As for the overall weekend play, Cash noticed a few areas for improvement. The 2019 Para Ice Hockey World Championship will be Hoff’s first world championship as a head coach. An assistant coach on last year’s gold medal-winning team at the 2018 Paralympic Winter Games and Team USA’s silver medal-winning effort at the 2017 world championship, Hoff said the adjustment from assistant to head coach has been smooth. Cash echoed Hoff’s comments, acknowledging how the smooth transition within the coaching staff has helped for continuous success on the ice. Hoff is no stranger to being a head coach. He runs the boys’ program at Bottineau High School in North Dakota. When he was an assistant for the sled team — first under the late Jeff Sauer, then under Guy Gosselin — he got to work closely with players on specific parts of the game. But now, he has to take a broader view. The lessons learned, for both the team and Coach Hoff himself, will be put to good use as the U.S. prepares to open the world championship against Canada on April 27. While the U.S. enters as the reigning Paralympic gold medalists, Canada are the reigning tournament champions after edging the United States, 4-1, at the 2017 event. Team USA, which has won world titles in 2009, 2012 and 2015, as well as four of the past five Paralympic gold medals, will then face South Korea on April 28 and finish Group A play vs. Norway on April 30. Group A has the strongest four teams in the tournament. Tournament play begins April 27 and will be streamed live in the United States on livestream.org.